Charlotte Flair heads to the ring. Charlotte says that the only thing more dangerous thatn ignorance is arrogance. Becky Lynch’s arrogance got her suspended on RAW last night, and Charlotte hopes Becky learned her lesson. She hopes Becky will be okay for Wrestlemania. If not, then Charlotte knows someone who is 100% healthy and would love to face Ronda Rousey. Charlotte points to the Wrestlemania sign. As Charlotte points, Becky Lynch limps towards the ring through the crowd. Charlotte narrates as Becky makes it into the ring. Becky and Charlotte yell at each other until Triple H comes out and heads to the ring. Triple H tells Becky to go home. He also tells Charlotte that this doesn’t concern her and that she should leave. Charlotte leaves. 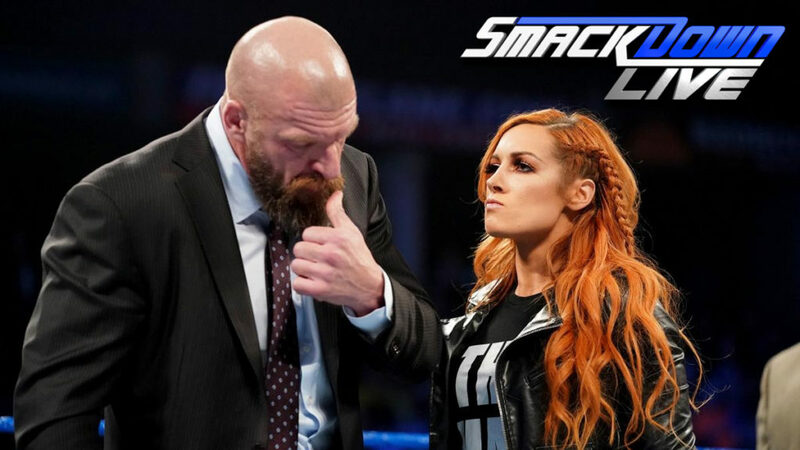 Triple H tells Becky to see the doctor if she wants to lift her suspension. Becky says she doesn’t trust Triple H, but Triple H doesn’t care. It is what it is. Triple H again tells Becky to leave, then he begins to leave the ring himself. Becky asks Triple H how Stephanie is after she punched her in the face. Triple H stops. He gets back into the ring. He finally understands what Becky is. He bought into “The Man,” but now he sees she is just a self-destructor. She’s looking for a way out. He recounts her suicide mission on RAW that put her in “medical prison” and prevented her from facing Rousey at Survivor Series. Now she has another chance, and she has another convenient excuse and another way out. Triple H says Becky is scared to go to the doctor. He doesn’t even think Becky is injured. He says she’s scared that the doctor will clear her to face Rousey, because if he does, then Rousey will expose Becky as a fraud. Becky slaps Triple H. Triple H stares at Becky, and Becky smiles. Becky backs away and heads out through the crowd. Good match. Rusev and Nakamura weren’t ever really on the same page, though Rusev and Lana seemed to be way off on their own page while Nakamura just went about his business in the ring. In the end, Nakamura and Rusev did work together in a way to bring about the finish of the match. I can’t say I like how they just threw Nakamura and Rusev together (WWE doesn’t need to always put rivals in a tag team), but they are both fun to watch. I’m not too happy about the good brothers being used as a prop in their story though. I mean, at least Anderson and Gallows are on TV again finally, but I don’t think this match helped them much. Mustafa Ali says no one expects him to beat Orton or survive the Elimination Chamber, but what if he defies those expectations? What if? Paige introduces a trailer for Fighting With My Family. The Usos say Miz and Shane sound like they’re trying to be like The Usos, but The Usos are different. Next week, McMiz TV is about to get locked down. Very good match. Orton completely dominated Ali for the first few minute of the match, but Ali began a comeback with some well-timed offense on the outside. Ali was able to use his wits and agility to keep Orton off-balance and guessing, and that led to an increasing sense that Ali might actually win the match. I started the match with no belief that Ali would win, but I started to believe he could do it as the match went on. The final couple of sequences were very well done and quite memorable. This was a great match for Ali. After the match, Samoa Joe puts Randy Orton in the Coquina Clutch. After a few seconds, he releases the hold and kicks Ali out of the ring. Joe stands tall as Orton and Ali are both down at ringside. As Joe leaves, Daniel Bryan comes out and heads to the ring. Joe approaches Bryan, but Erick Rowan comes out and steps in front of Bryan. Joe decides to avoid Bryan and Rowan as they head to the ring. Samoa Joe says that tonight is about retaliation. Elimination Chamber will be about justification for Joe’s means when he wins the WWE Title. In the ring, Bryan says he can finally speak in front of people who understand what he’s trying to do. The people of Washington are intelligent, and they realize that we need change. Unfortunately, as WWE champ, Bryan has to speak to a global audience, and audience that is killing the planet. Bryan is fighting an uphill battler, and that’s why he created the new WWE Title. The new title is a symbol of excellence and a symbol for change. Rowan says that people consider him and Bryan dangerous because of their ideas. People fear them, but they mostly fear Bryan since he is the champ. People will try to silence Bryan as long as he is the champ. Bryan says he serves a greater power than corporate greed. He is the planet’s champion. The suits in the back don’t like it though, and that’s why they put him in the Elimination Chamber. The ignorant masses need Bryan as champion, and the planet needs him as champion. Jeff Hardy says no one has disrespected the WWE Title the way that Daniel Bryan has. Tonight, he’s going to go out there and show Bryan that he needs to shut up. AJ Styles walks up and wonders if Jeff is really the right person to represent the WWE Title. Hardy wonders if Styles is worthy of holding the title after his recent loss to Bryan. The two men argue until Hardy says they’ll settle this at Elimination Chamber. Sonya Deville tells Kayla Braxton that Naomi and Carmella are in over their heads. Mandy Rose says she and Sonya are the only two women in the tag title match that have ever been in the Elimination Chamber. Good match. Rose and Deville looked strong early in the match, then the match broke down after a commercial break. Naomi started kicking everyone, and that led to a fast-paced finish featuring Naomi and Mandy Rose. This continued the Rose/Naomi feud while making all the SmackDown teams entering the Chamber look good. Andrade smiles as Zelina Vega talks about how he stomped out the legend of Rey Mysterio last week. WWE celebrates Black History Month. Is anyone ready for Asuka? Good match, but the finish wasn’t great. I’m not a fan of the overuse of the babyface about to beat the heel only to have interference cause a DQ. It’s okay to have Bryan win here. That doesn’t mean Hardy couldn’t have beaten him, it just means he didn’t beat him tonight. Other than that, the action was good. After the match, Bryan puts Hardy in the LaBelle Lock. Samoa Joe runs up, takes out Rowan, and puts Bryan in the Coquina Clutch. Orton runs to the ring and brawls with Joe. Mustafa Ai appears and hits Joe and Orton with a missile dropkick. Ali dives onto Rowan, but Rowan catches Ali and palms Ali’s head while slamming him onto the announce table. Styles runs to the ring and attacks everyone. Bryan and Rowan have escaped up the ramp, so Styles just stares up at them. Bryan is furious that he has to answer questions from Kayla Braxton immediately after his match. Bryan says the new Daniel Bryan is going to be champion forever because that’s what the planet needs. I liked the show. There were some things I didn’t care for (which I mentioned above), but overall this was an entertaining show. This match got me the most invested in the outcome tonight.